Mpower People CIC provide a variety of activities aimed at empowering individuals towards living healthier, more independent lives, through a range of sports and healthy living education programmes and activities or training relating to increasing sustainable employment opportunities, enterprise development or personal development. Initially aimed specifically at those who are from disadvantaged groups, for example NEET (not in education, employment or training) clients, BEM (Black or ethnic minority) members, anyone living with a health condition, or long-term unemployed, etc. but now open to anyone who feels that they can benefit from our services/activities. 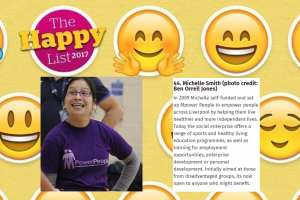 Michelle Smith, our CEO and Founder was named by the Independent in June 2017 as one of Top 50 Most Inspirational People in the UK. The Independent’s ninth Happy List is a collection of 50 inspirational heroes and heroines whose kindness, courage and selflessness make our country a better place to live. The Happy List was founded in 2008 as an antidote to those tedious lists that celebrate wealth and big bank balances. Instead, it honours the Great Britons doing extraordinary things for others with no thought of personal gain, who often go largely unnoticed and unrewarded.